We all know that there is nothing quite like cruising on a motorbike. Especially so when you can feel the pure power lurch under you and the feeling of the world being ripped out from under you. There really is nothing like it; when you reach a certain speed, it almost feels like you’re flying over the tarmac. However, there is one priority when it comes to bikes. That priority, of course, is safety. Safety should always be your first and foremost thought whenever you climb onto your bike. So, with safety in mind, we decided to scour the market for items that are unique and that can potentially save your life. Those items are 7 Motorcycle Vest That Will Keep You Safe. This vest is extremely lightweight and low profile. It features both a padded front and back. If you were looking for something that is exceptionally lightweight and doesn’t have a hard construction, then the Xelement Padded Vest is for you. This vest only weighs 1.4 pounds, which makes it the lightest of all the vests in this list. However, instead of having plastic shells for protection, this vest only has pads. Obviously this also aids majorly in comfort, but it doesn’t deliver the same protection that some of the other vests provide. The Xelement is constructed out of 600 Denier high performance breathable, waterproof and laminated fabric. It also incorporates mesh into the design for efficient cooling. The padded design is used on the front, specifically the abdominals and chest, as well as on your back. It also has two zippered pockets on the front. The Xelement also has an extremely low profile design and can easily and comfortably fit over your shirt and under your jacket. The Lunatic Fringe was built for protection. This is a must have for any serious rider. Looking like something that the Punisher would wear, the Lunatic Fringe is all about your protection. Apart from looking as awesome as it clearly does, this vest truly does display some amazing safety tech. Starting off with the materials, the Fringe features a tri-composite Fierce Mesh coupled with P.U. and a Flex Foam Frame. 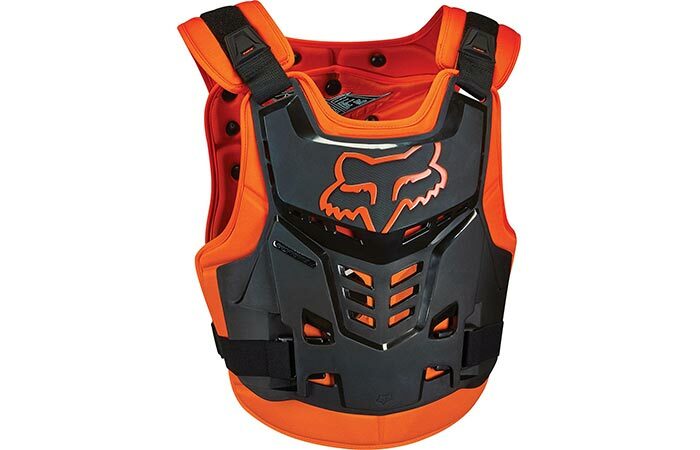 The chest protector is made with an injection mold to ensure that there are no chinks in the armor. In addition to the chest protector, this vest also comes with a C.E. approved injection molded spine protector. This means that you are covered in the front and the back. Adjusting it is super easy with the lockdown waist and shoulder adjusters. If you were worried about comfort, this vest also comes with a Flex Form Construction that allows for optimal mobility. It also weighs in at 10 pounds. The Lunatic Fringe is definitely a vest for the serious rider. This vest features a articulated PU shell that doesn’t compromise on safety. 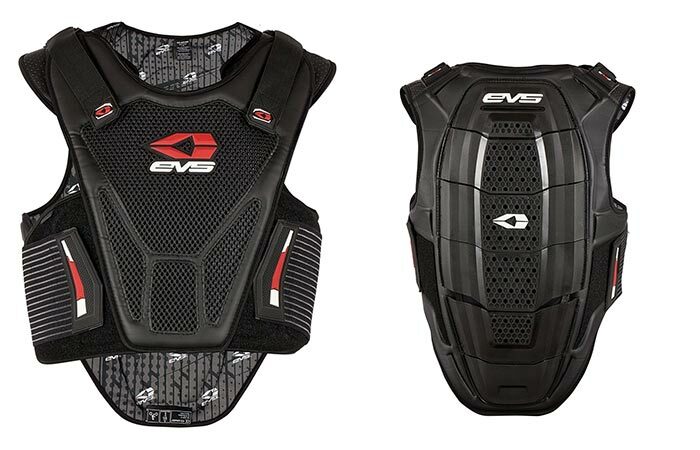 If you were looking for something lightweight and low-profile, then the EVS Sports Vest would be your best bet. Even though it is super light, it doesn’t compromise on protection. 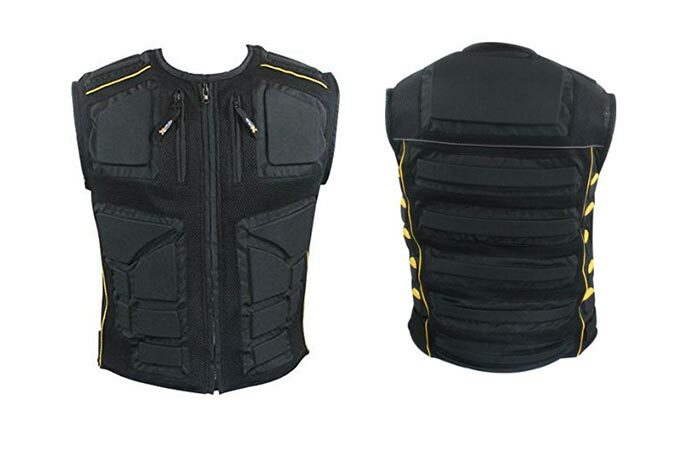 The main safety features of this vest lies in the fact that it is constructed with a reinforced articulating PU shell. Furthermore, any fall or blow is softened by the foam impact chest protectors. As for your back, this vest comes with an adjustable kidney belt. The adjustable shoulder straps ensure that you always have the optimal fit. When we mentioned that it was light, this vest only weighs in at 5.6 pounds. The low profile design also means that it can fit under most jackets. The Titan was designed to protect all of your crucial areas. Including chest, back, shoulders, arms and elbows. Fox Racing has long been known for their excellent quality products in a variety of extreme sports. As far as protection goes, their Titan Sports Jacket delivers on the money. The Titan Sports Jacket features a unique design that was created to deliver the maximum protection for a variety of sports, including mountain biking, street racing and even longboarding. The front features a two-piece chest plate that has been constructed out of high impact plastic. While the back features articulating plastic shields for added protection. The back plates are also removable, if you decide that you don’t need them. Furthermore, the shoulders, elbows and forearms all feature hard shell padding. These cover all your possible vulnerable areas. So, if it happens that you do fall, you’re covered. As far as comfort goes, Fox knows that performance is largely based on comfort. The entire jacket is constructed out of a soft, vented mesh. This allows you to remain cool, so that you can reach ultimate performance levels. The protective plating is also vented to aid in air flow and doesn’t feel heavy. The Titan also fits like a glove and can easily be removed via the front zipper. In addition to that, the adjustable elastic straps ensure that you have a proper fit every time. The design is also low profile and can fit under most jackets. The Titan Jacket is super lightweight as well and only weighs 4 pounds. 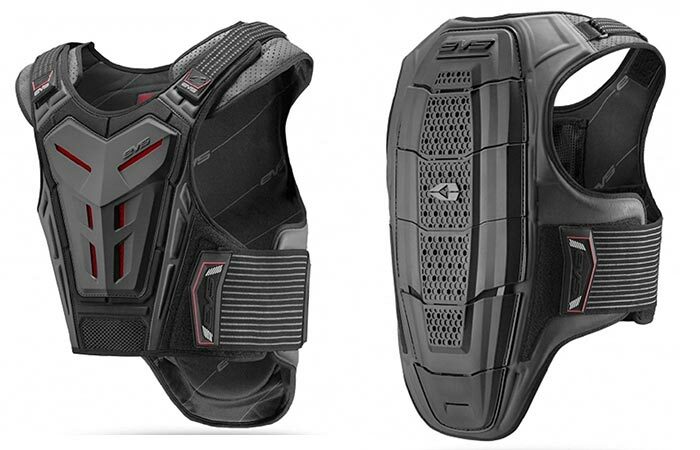 The Street Racing Vest by EVS was designed for protection and speed. The hump was specifically designed for optimal aerodynamics. Another great product by EVS, the EVS Street Racing Vest, just looked that good that we had to feature it. At first glance, for all the console fans out there, we couldn’t help but notice that it looks like an extremely compact version of the Spartan armor from the Halo franchise. This vest is extremely lightweight at only 2.5 pounds and comes with adjustable shoulder straps for a proper fit. Furthermore, it features foam impact chest protectors, back protectors and an adjustable kidney belt. This, essentially, protects both your chest and back in a fall. To ensure that you get optimal performance, this vest comes complete with an aerodynamic hump. The low profile design also means that you can wear it under your jacket. This vest is also exceptionally breathable and will keep you cool while you race. This vest uses an easy-to-use buckle system. The back plate can also be removed so that only the chest plate is worn. Another product by Fox Racing, the Proframe Roost Deflector, delivers both comfort and protection. At first glance, we can’t help but say that it looks pretty awesome. It features a low profile design that is compatible with a neck brace. To ensure that you have only the best fit, it comes with adjustable shoulder straps. This allows for optimal comfort, with or without the neck brace. Furthermore, there is an exceptionally easy to use buckle system that is integrated into the chest plate. You also have the option of removing the back plate so that you can use this vest as a chest plate only. The back plate can also be used in 2 different positions for a precise fit. Much like the Fox Titan, this jacket was designed to protect all of your crucial areas with high-impact plastic. The last one on our list is also a jacket. 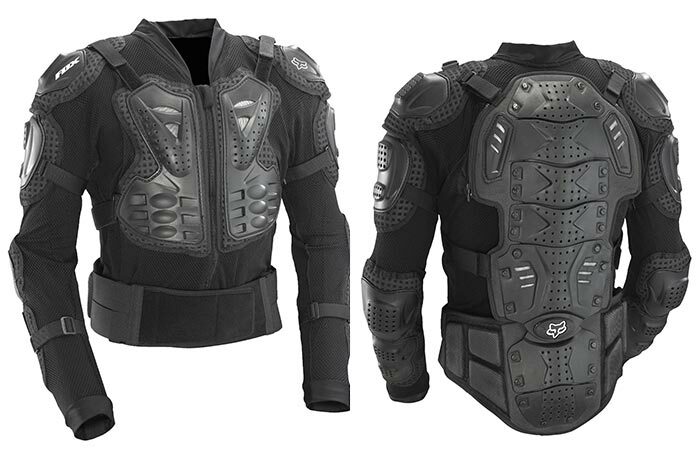 If you were looking for overall protection then the Body Armor Body Guard Jacket is exactly what you need. 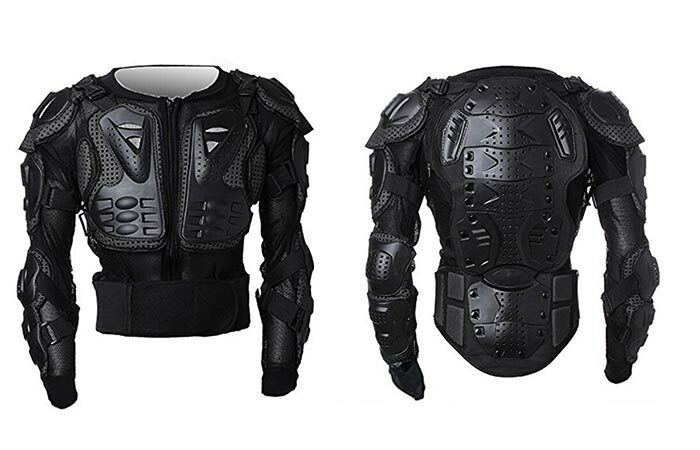 This jacket features an anatomic high-impact two-piece chest plate. It also has a removable articulated back plate. 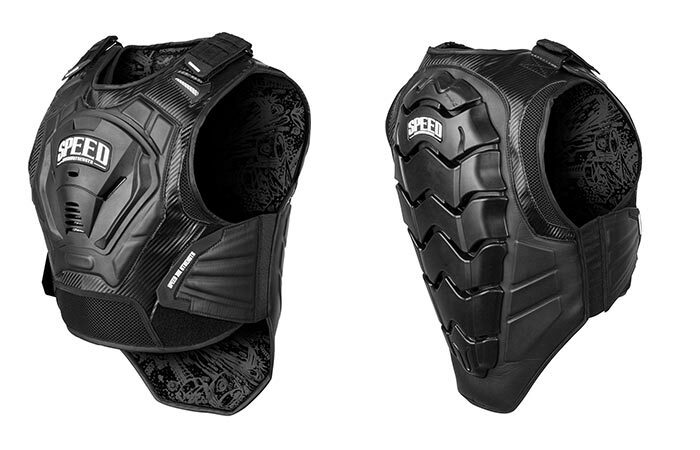 To ensure that you have overall protection, this jacket also comes with both plastic shoulder and elbow coverage. This means that no matter how you fall, all of your crucial points are protected. In addition to these qualities, this jacket is constructed out of mesh that is both soft and breathable. This allows you to stay cool for optimal performance. Furthermore, its low profile design allows you to wear it under your jacket, if you choose to do so.